Welcome to an other issue of Meet the people, where we talk to members of ED and scrape beneath the surface of work in the world of digital design with absolutely no tangents or sidetracks into other subjects whatsoever. In this issue we get to know one of our men from Oulu, a man of few words, Lasse Lakela. Before joining ED, Lasse worked as a art director for ad agency Siberia for three years, and prior to that at marketing agency Design Valkea, focusing on pharmaceutical marketing. He also used to do summer gigs as a post man for six years, waking up at four every morning, learning the hard way what passion really means. Shoot. I’ll make it quick for you; no, thanks and bye. Ok. Well could you tell me what kind of hobbies you have? Hobbies.. My hobby is bikes. Riding, and building fixies. 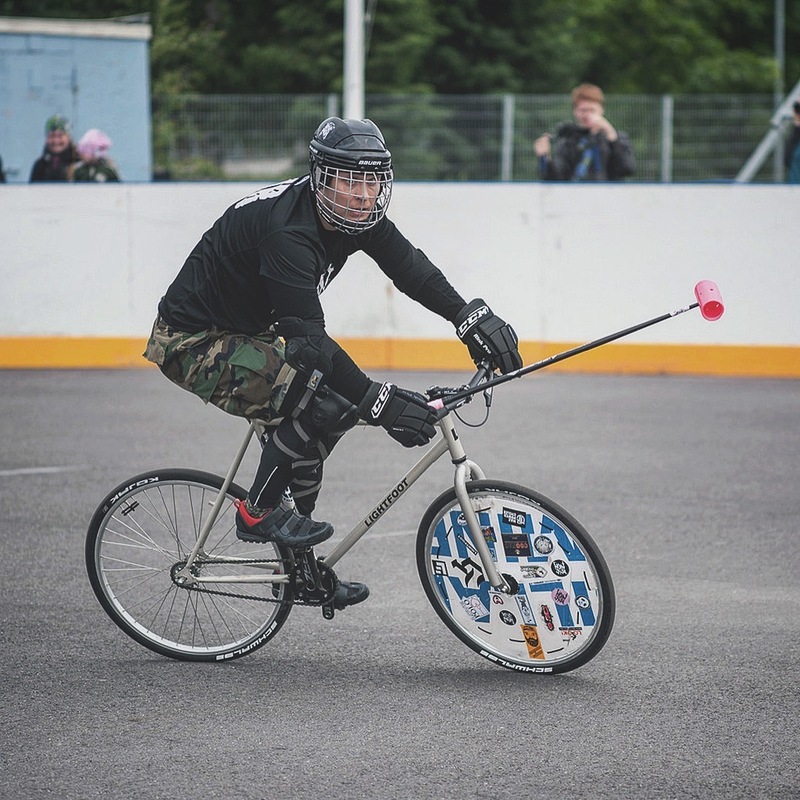 I also do bike polo during the summer. It’s like normal polo but invented by poor people. Bike messengers in Seattle came up with it in the beginning of the two thousands. Our team came second in the finnish championship last summer, by the way. It’s 3 versus 3 on a fourty by twenty meter field, with sticks that look kind of like crocket sticks, made out of aluminum except for the ends which are plastic. Although the vehicle in use sounds a lot less dangerous than a horse, somehow that sounds really dangerous..
Do accidents happen a lot? Like what’s the worst thing that has happened that you’ve seen? Well mostly people fall over a lot, so broken knees and stuff like that. Last summer the worst thing that happened was that someone broke their front teeth when they flew face first into the asphalt. But in a way that’s your own fault if you choose not to wear adequate protection. It’s like any high speed sport in that sense, accidents happen. Ouch. I heard you also do crossfit? That too. Gotta have activities, a way to wear myself down. Can’t sleep otherwise. It’s not enough to get through a day of work, gotta do something else too. The shared characteristic of my hobbies is generally that I get to compete. I hate losing. More than anything else. I know HOW to lose. But I hate it. With no segway whatsoever; if you were a color, what colour would you be? I must admit that I saw that one coming. Let’s make this harder: If you were any other color than black what would you be? The red, black and white of our office hasn’t rubbed off on you yet? They’re very nice colours, but black and yellow are much better. Can’t give you a hex for that, but it’s a nice warm yellow. A good yellow. Kind of like the yolk of an egg. But aren’t those usually more like orange? Before ED you worked with marketing for pharmaceuticals for several years. How is that environment different from working with working in marketing in general? Things are a lot more restricted. Everything that you say has to have some kind of fact, with studies behind it. You can’t say that this product will save you, if you really can’t know that it will. Also, in pharmaceuticals there are two sides to the marketing. There’s the stuff that’s aimed at consumers and the stuff that’s aimed at doctors. I worked with the stuff that was aimed at doctors, basically trying to convince doctors of what to prescribe to their clients in a given situation. So blood pressure medication or anti-depressants for instance. So could you use any kind of creative freedom? In digital, not really. You could do some things with images, but the content of those has to strictly relate to the subject matter. At worst, half of the surface of the ad might be covered in small print. It didn’t leave much space for anything else than the name of the product, the effective substance and that was that. In print it was possible to do something a bit more interesting. To create something that sticks out a little from the merciless pile of mail that gets pushed through the door. Something that folds nicely or is cut into shape, like a football sized and shaped ad that would open like an accordion. A lot of which, I have to assume, was the small print? In the end it was one of the reasons why I left, too many restrictions on what could be done. What do you do at Exove Design? Visual design and user interface design, or how you want to put it. Moving on to “harder” questions; what is the meaning of design in every day life, and society as whole? I see it as usability and something that just works well. Something you may not even notice. Something that you just use and you don’t really have to think about it at all. What about the societal angles? Uhh, I don’t know. Are there any? Well maybe what I’m going after is that there are instances of design that affect people’s lives on a large societal scale. Say anyone who has been using tax-services (although those have improved a lot) or applied for welfare benefits online will have come accross some pretty daunting design decisions that don’t seem to be in place to make people’s lives easier. Yeah so we come back to usability. Solving the problem of people ever even having to fill out those forms. Told ya. How do you spot bad design? From it not being finalized. From the details. You can’t necessarily put your finger on all of it; typography, whitespace, positioning, things like that. Some times it’s very isolated. Sometimes some parts might work and an others are completely fucked up. Designers have a certain vocabulary for dealing with different aspects of design, like you mentioned, whitespace and typography and so. What about someone that doesn’t have that vocabulary or doesn’t work with the tools and concepts we work with every day? Do you think that designers have a disposition for noticing bad design? Or is it something that anyone really could spot? In a way of course, I pay attention to the things that relate to what we do every day. Much like a crane operator probably notices things about cranes that others wouldn’t. A person who doesn’t look at the world so visually probably won’t notice a difference (between good and bad design), at least in my experience. Then again, if you’re visually pedant otherwise, even if you don’t work in our field, maybe you’ll pay more attention to the aesthetics of a thing and notice that hey, “this looks better than this.” Quite often people have an opinion about anything if you ask enough. And our field is in many ways a field of evaluation, of opinion.. a visual field if you may. Mmmm… yes I guess you could say that. In a way. In my own way! I like beautiful things. You said that bad design can be spotted from little things that are done wrong. Visual things in particular. They can be textual things too, copy, though personally I don’t write. Either it’s too hard to understand or it’s otherwise badly expressed. What do you think that’s caused by? Partially, probably because things aren’t given enough time. Or an uneven amount of effort goes into different aspects of a design. Everyone (in our field) has probably encountered a not-so-receptive customer who you have to make concessions to, and it often results in going from “where the fence is at it’s lowest”. You mean letting the customer dictate the result? Mmm, yeah. And also that designers are trying to get over a project as soon as possible. I believe, or at least I want to believe that given enough time results would be better. How do you make sure in your own work that you avoid problems like that? Well you can’t exactly ensure it, but you can take the attitude that “im going to do this properly”, regardless of the case. That you don’t just try to run through a project as quick as possible. Some times that means that you work on something on your own time, so to say, and think “how could I do this differently”. Of course there are things that you can’t affect, things you just have to live with, and then you do. But as a rule, do everything as well as possible. As a result, it can be a bummer if everyone on the project isn’t in the same frame of mind. What do you think is the responsibility of the designer in that scenario? The responsibility of the designer is to do a good as job as possible, perhaps even better. Doesn’t that really apply to anything, not just design work? Is there anything specific about working on the design aspects of a project that would affect how you go about doing “better”? I mean, different than something that’s more on the repetitive or motoric end of the work spectrum that doesn’t necessarily require the thought work that often (hopefully) goes into design? Well there’s the passion for the job. That you want to do something that’s good that you’re willing to stand behind. Whereas if you’re sorting out mail for the post office, you don’t have to have much passion for sorting. I worked for the post office for six summers, so the only passion required was to be able to wake up at four in the morning. Anyway, maybe that’s the measurement, the passion you can put into the work. I dunno, maybe someone can be really passionate about carrying mail every day. Well yeah, isn’t there something satisfying about being able to check things off your to-do list just by being at a place at a given time. Well yeah, there’s also the side to it that your work will never follow you home. Except when you receive mail. Then yes. But someone else is bringing it. In a way, in the creative field, whatever your specification is, I don’t believe that you go to work from eight to four, sit there, spend all your time on that there, go home and never think about what’s going on at work. It’s impossible at least for me. You can’t just shut down a creative process. That’s a good point. Kind of a flip side to the rewardingness of creative jobs. That even though the job doesn’t physically follow you home, the mental side sticks to you. At least you can always go and play bike polo. And that’s all folks. 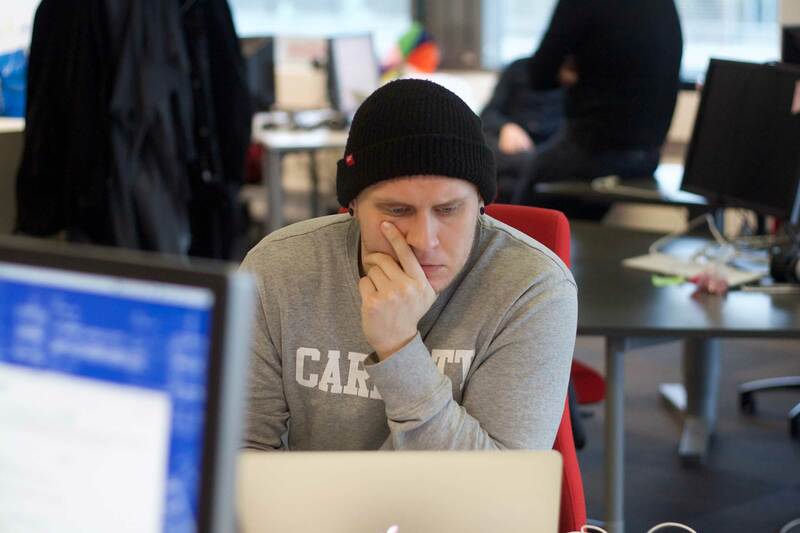 Hope to see you on our google analytics next time too, when we find out what Juha thinks about.